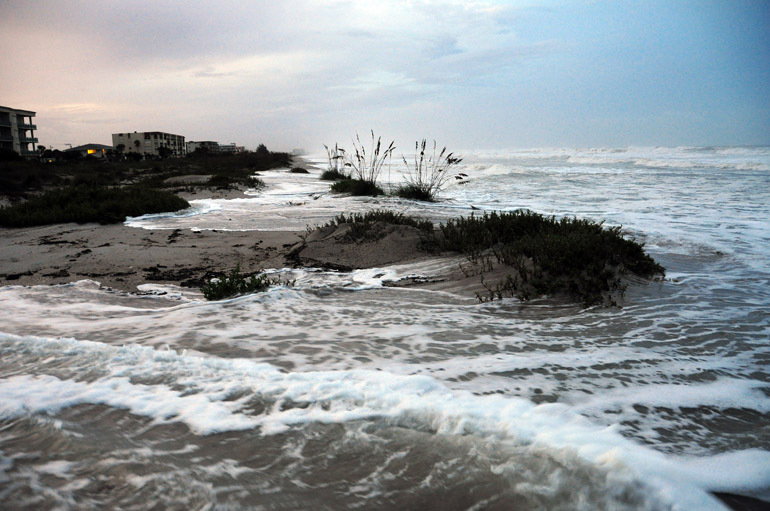 Irene's waves covered a wide swath of Cocoa Beach, causing some erosion but no serious damage. Five days before its projected landfall, Hurricane Irene appeared to be heading directly toward Brevard County. But I remember someone in the Florida Today newsroom saying that if we're in the bull's-eye five days prior to a storm's estimated time of arrival, chances are good that we won't get hit at all. The storm turned to the northeast, and its center passed about 200 miles east of the Space Coast. At the time, though, Irene was about 400 miles wide, so we did feel some limited effects of the Category 3 hurricane. 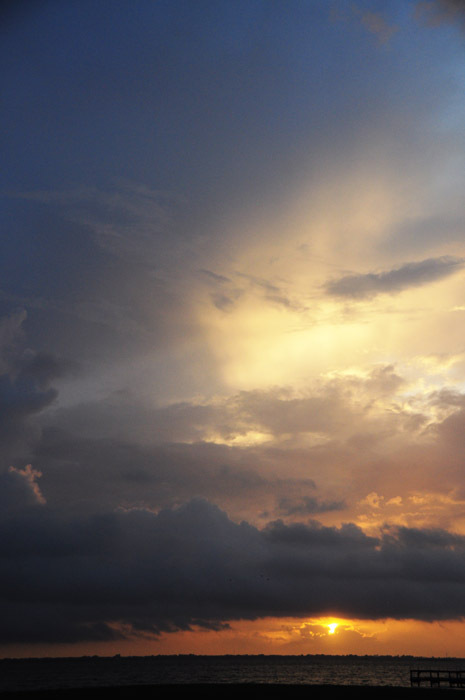 We had two bands of heavy rainfall that Thursday afternoon, but accumulations were no more significant than in typical summertime thunderstorms. I drove to the beach, however, where the storm surge was more than I was expecting. 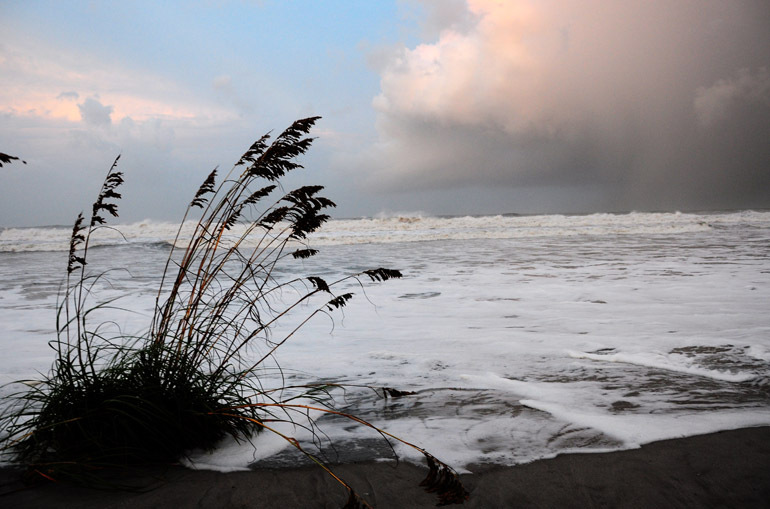 The waves washed over the grassy dunes and lapped at the steps of the boardwalk in southern Cocoa Beach. Ocean water covered an approximately 100-yard-wide beach. For a storm that was 200 miles out to sea, I thought that was pretty impressive, and it left me curious as to what the conditions would be like if such a storm actually made landfall here. I have not yet experienced that. I had actually stashed my sandals behind the sea oats, pictured here, thinking they would be safe from the surf. The waves ended up reaching my footwear, however. Fortunately, they were not swept out to sea, and I recovered them. 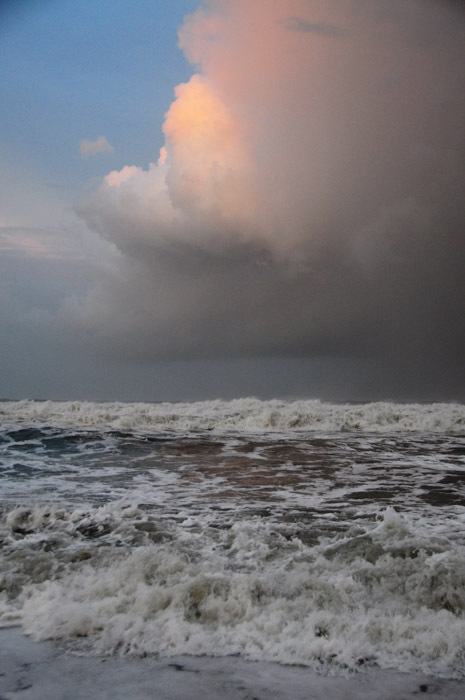 A very angry Atlantic Ocean just after sunset. Earlier, this was the sunset over the Banana River, just west of where I was snapping the surf photos on the barrier island of Cocoa Beach.